« Today, the Internetz called me a douchebag. This entry was posted	on Thursday, June 24th, 2010 at 2:24 pm	and is filed under General Chang, neverbeengood. You can follow any responses to this entry through the RSS 2.0 feed. You can leave a response, or trackback from your own site. Very, very true. I’m sure it’s the same about every place, and I’m glad you got some people to help you out! I am sooo lost in IKEA, I don’t know what I’d do if I was actually looking for something in specific to buy, and there’s no one around for me to ask when I go, so I just try to eventually find the exit door cause’ it’s so huge. At least they have a path so you don’t get lost! 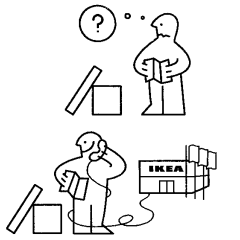 A very similar thing happened to me at the Singapore Ikea. Some great staff and some very rude ones. I still love Ikea products though.